The most powerful raptor in Africa is the Crowned Eagle. It is smaller than both the Martial Eagle and the Verreaux’s (Black) Eagle, and is, in contrast to its larger relatives, a proper forest specialist. Its dark, mottled plumage allows the Crowned Eagle to blend into the dappled light of the forest. The proportions of this eagle are a little unusual. Round paddle shaped wings and long broad tail gives it exceptional agility and powerful acceleration within the tight spaces of the forest. This eagle is perfectly suited to ambush prey within the canopy and undergrowth and often tackles prey several times its own weight. 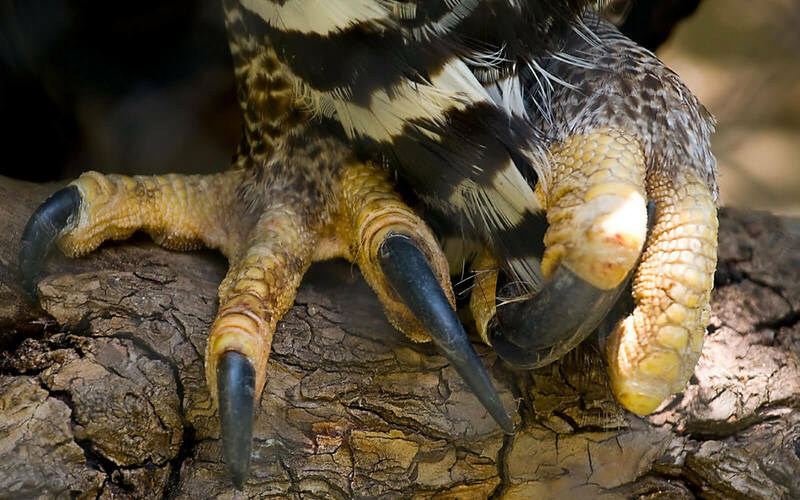 Most importantly the Crowned Eagle has almost cartoonishly oversized feet. The thick tarsus contains an enormous tendon, and short stout toes amplify its grip delivering that strength to the tip of 60mm long talons. Crowned Eagles throughout their African range prey on a variety of medium sized mammals; duiker, monkeys, hyrax (dassies), mongooses and other small carnivores. In some areas birds and reptiles may also account for a few percent of the prey. Distributed from the Afro-tropical jungles, the east African woodlands, and south to the eastern limits of the Cape province, the Crowned Eagle is listed as Near Threatened (IUCN Red List 2018), and regionally Vulnerable. Crowned Eagles grow very slow, and once fledged they have a long dependency period. It takes many months to learn to hunt intelligent and difficult prey using stealth and strength. 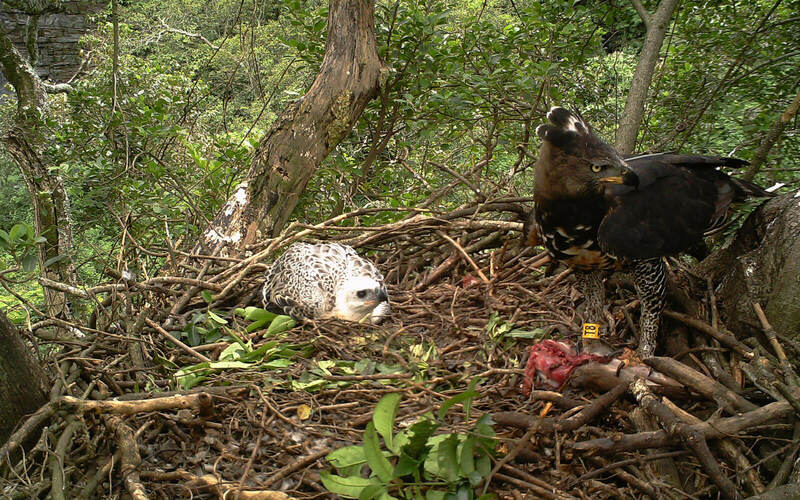 This is perhaps why the Crowned Eagle can only produce one chick every second year (biennial breeding). Adults can live over 15 years in the wild and mature at 4 or 5 years old. These traits make it difficult to bounce back from population declines and can make it hard to identify the sustainability of a population. One danger is when high mortality of young birds results in low recruitment of the breeding population, which could result in a delayed and sudden collapse of an ageing population. Since at least as early as the 1970’s a pair of Crowned Eagles has occupied a territory centred at the nest site at the Ronaldskloof waterfall in the Krantzkloof Nature Reserve. Over the decades the city has grown and developed around this reserve, perhaps boxing in these eagles within their urban forest reserve. Historically, the Crowned Eagle has gained local infamy and negative publicity when they feature in newspaper letters and articles when hunting or attacking a cat or dog in a suburban garden. So, it was with great interest to me when I visited Durban in 2011 and heard of this intriguing situation with potential pet hunting eagles that are in turn of conservation concern. What was the population status of these urban eagles? How could I influence the conservation value of the area for Crowned Eagles? How important were pets and livestock as prey, and how could we address this human-wildlife conflict arising from “problem eagles”. I found supervisory support at University of KwaZulu-Natal with Professor Collen Downs and Dr Mark Brown and began what was to become a PhD with two primary objectives: to map the distribution and habitat requirements of these eagles and investigate the prey choices in the urban areas. Sample size is of critical importance in gathering knowledge and publishing results, often a difficult task when studying rare species. At the outset we were merely hopeful to study a dozen territories around Durban and Pietermaritzburg, but I was happy for any information from the Karkloof to the Coast, and from as far afield as Mtunzini to Port Edward. Initially, the surveys were mostly about social networking and gathering local knowledge. I was pleased to see that local birders, falconers, and conservancies often knew a nest or two. Stitching together information from these groups, we quickly compiled a list of 20 pairs in the first season alone. That was followed by some extra groundwork in more remote forests to fill in some apparent distribution gaps. Six years on and we attempt to monitor 90 pairs in the southern KZN region. In the upper highway area from Westville to Hillcrest there are 17 active territories! From my somewhat outsider perspective, I find this incredible. It is important to highlight that Durban is one of Africa’s Megacities – a city of over 4 million people. 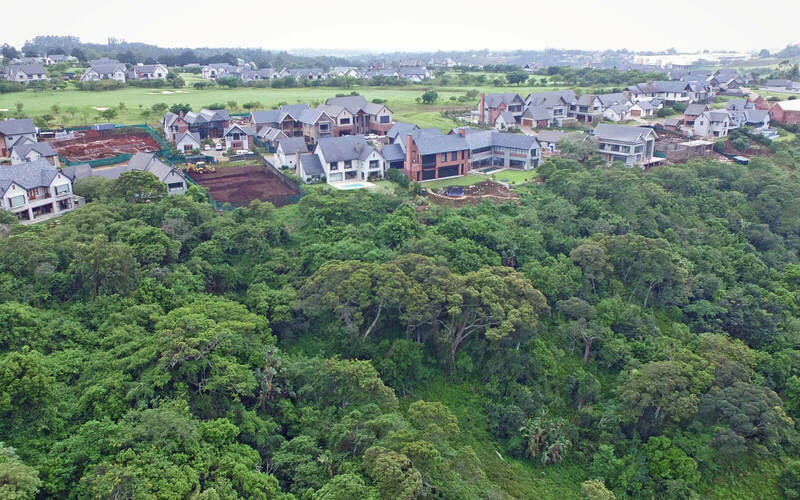 The eThekwini Municipality Environmental Department began incorporating habitat and ecosystem services into city planning in the 1970’s, ultimately developing into an extensive network of forests and grasslands designated as the Durban Metropolitan Greenspace System (DMOSS). The DMOSS is highly connected by river catchments and hosts a surprisingly diverse community of indigenous biodiversity. In addition to the high numbers of breeding pairs, we were surprised to discover that some pairs were producing one chick every year. So it seemed there were not just a handful of remnant pairs holding on, but that Crowned Eagles were adapting to the challenges of an urban life and succeeding beyond expectations. Food is the most basic requirement for survival and these eagles were not only feeding themselves, but raising a ravenous chick every year. What were these Crowned Eagles feeding on? Generally the Crowned Eagle diet was well known from studies in natural habitats. Raptor diet is usually studied by collecting prey remains from around the nest tree, but these collections can be biased towards durable remains like mammal jawbones. The alternative is to attempt direct observations of prey deliveries from a hide. Crowned Eagles tackle large prey and feed their young for two or three days from one item – observations can be time consuming and testing on patient endurance for a low return of data. Besides, we wanted to collect data from nests in suburbia – those with the greatest chance of answering whether pets and livestock were numerous or nutritionally important. These days technology can provide biologists with new and more efficient ways to overcome these hurdles. Camera Traps have become affordable and reliable. By operating remotely for weeks at a time one researcher can gather a large dataset of high quality close up photos. All this reduces biases found in other methods and increases efficiency. The challenge however was to climb to each nest to install the camera, and then return repeatedly to service and retrieve the data. The advice from experts were that Crowned Eagles were well known to defend their nest-bound chick by attacking intruders, but importantly the disturbance did not cause the eagles to abandon their chick. Thus, over the course of three summers, we installed 12 nest cameras and gathered 1 544 days of time-lapse data (just falling short of a million images). 914 individual prey animals were identified from these cameras. Camera trap image: “Yellow T8” delivers the hind limbs of a Blue Duiker to the chick at Tanglewood Private Nature Reserve, Kloof. 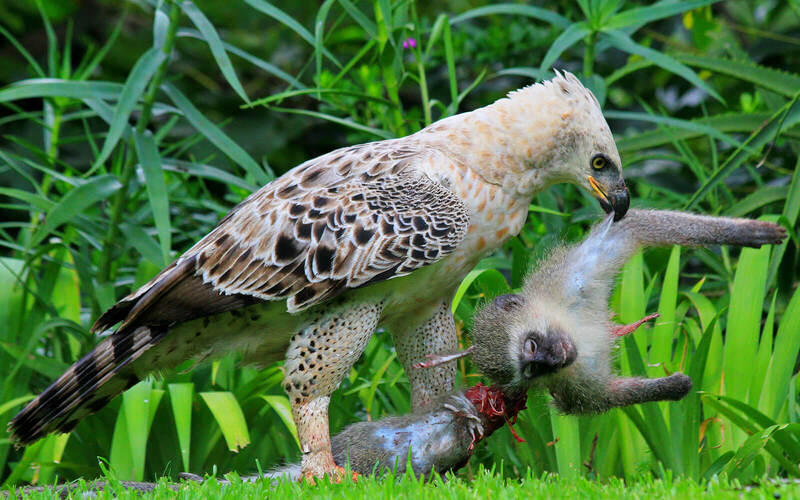 “Green V7” feasts on a vervet monkey after a successful hunt near Victoria Country Club in Pietermaritzburg. Crucially these data showed that cats (feral and pets) comprised just 0.8% of the eagle’s prey, while chickens were the most numerous domestic livestock recorded, but also only accounting for 3.3% of the diet. Crowned Eagles gain their important nutrition from urban wildlife – mainly Dassies (Rock Hyrax). 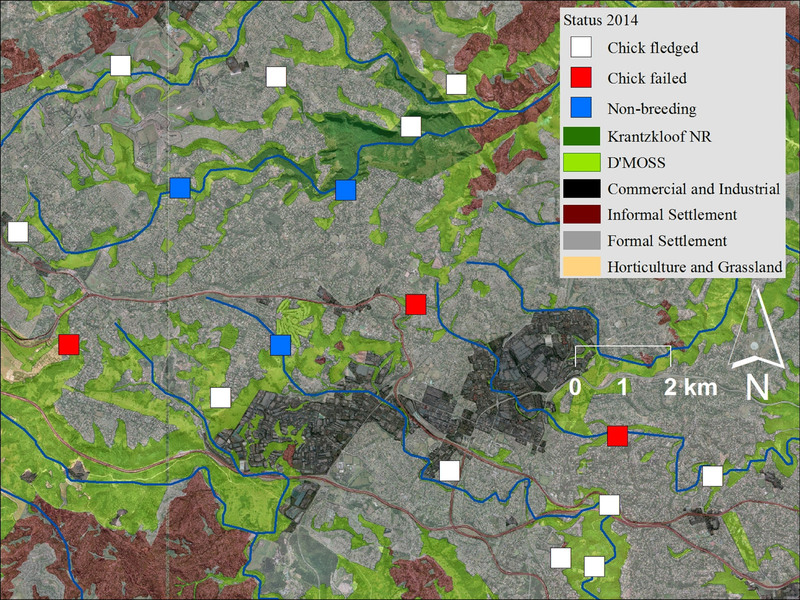 This data highlights the importance of urban wildlife for Crowned Eagles and demonstrates that the city is also home to good populations of Dassies, Blue Duiker, as well as mongooses, genets, and Vervet Monkeys. Surprisingly the nestlings of Hadeda Ibis were an important prey source during summer months. Because of their small soft bodies being entirely consumed, this information would’ve escaped our knowledge had we used more traditional methods of bone collections. Only a few cats, and no dogs were recorded as prey during this extensive camera trap study – however there is no denying that attacks on small dogs occur annually, and these have a big impact on families who have a pet injured or killed by an eagle. How can this be explained? The nest cameras were only recording prey being fed to nestlings during spring and summer months. In addition to the use of the cameras we documented every confirmed eagle-pet interaction that we could gather from social media and privately reported incidents – especially when photos could help to identify the age of the eagles. 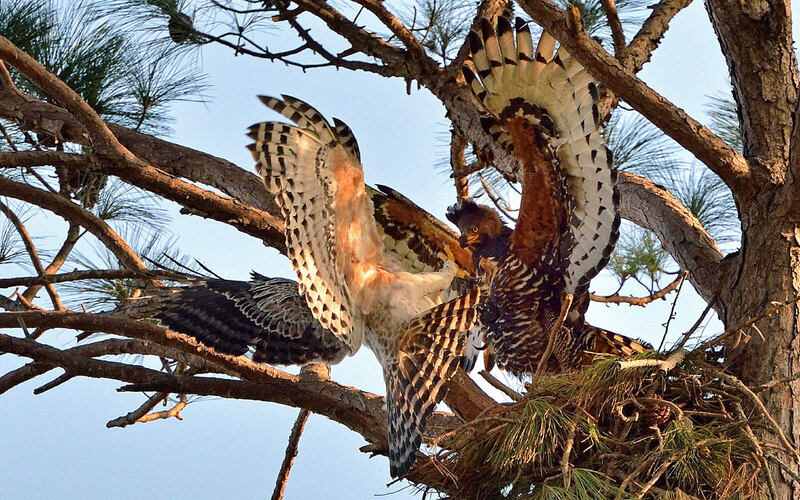 Most of these attacks are by juvenile and immature Crowned Eagles. Young Crowned Eagles are typically evicted from their parents territory at around 10-15 months of age. Adult eagles reduce their parental care and food provisions, forcing the young eagle to start hunting for itself. As spring approaches the adults will start courting and repairing their nest in preparation for a new breeding attempt. The young eagle may even find home life hostile and must start exploring new areas beyond its parents territory, developing hunting skills and avoiding neighbouring eagles defending their own territories. The first two years are the toughest time in any eagles life, and only a few will survive to maturity. At the onset of spring the adults direct their attention to a new breeding attempt. They may forcibly evict last years’ immature eagle. This is previously unrecorded behaviour, now superbly documented by dedicated Crowned Eagle photographer Jacques Sellschop. I am very sympathetic to the trauma of a family losing a pet to such eagle attacks. This must be balanced by the appreciation for the difficult struggle for existence that these young eagles face. Unfortunately, if a young eagle does have hunting success it might be more likely to become focus on pets as potential prey again. It is only a very few eagles that become repeated offenders, and we have been working towards understanding these behaviours and finding management solutions to reduce the negative influences of “problem eagles”. Solutions are never quick or easy. For instance, in the case of translocating an eagle away from the suburbs one must consider where it will go. If ample prey exists within an unfamiliar place it is likely the eagle will have to avoid the aggression of adult Crowned Eagles already in the area. If there are no resident eagles yet, then perhaps there is a good reason for their absence – a lack of prey would make its survival equally difficult. Except for our focused attention on managing repeat offenders, the removal of any individual eagle in the suburban areas of Durban will only create a vacuum for another one to fill. As mentioned earlier, it appears the suburbs are saturated with many pairs of breeding eagles producing a number of new recruits every year. It is a remarkable quality of Durban biodiversity that such wildlife-conflicts occur at all! While natural hazards such as starvation and competition with other Crowned Eagles are ever present, the urban landscape presents additional hazards. The most avoidable of which is direct persecution. Sadly, several eagles have been shot since we started our study. Some were targeted because they appeared to threaten chickens or pets. Others were hit by airguns which seem to be the pointlessly destructive and ignorant actions of bored teenagers in the backyard. Needless to say, persecution is illegal and Crowned Eagles are fully protected under the Nature Conservation Ordinances. Another cause of mortality with a potential high impact on the population is electrocution. Since 2012 eight Crowned Eagles have been collected under electricity poles and transformers because of electrocution. Difficulties in understanding the impact of deaths by electrocution are due to the extent and often remote locations of potentially dangerous infrastructure. 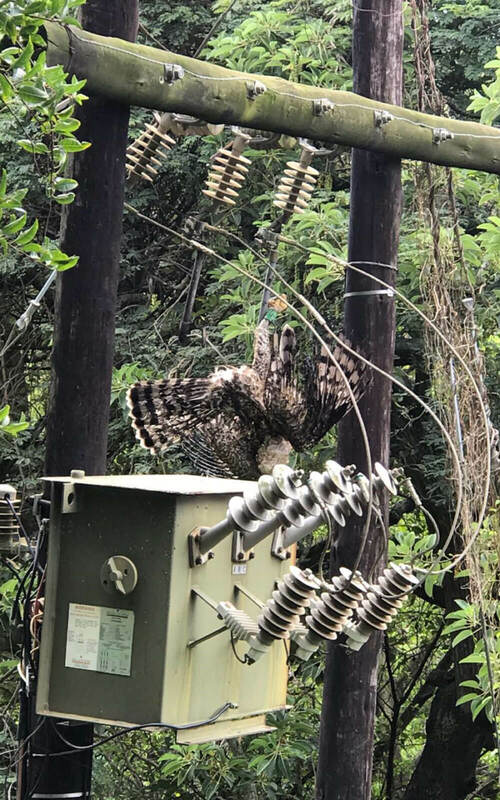 A close working relationship between ESKOM and the Endangered Wildlife Trust, as well as BirdLife South Africa’s Wildlife and Energy Programme, exists to reduce wildlife mortality and raptor electrocutions. This effort is improved by the input of citizens everywhere and you can help by reporting any wildlife electrocution incidents (with photos, GPS location, and tag number of the offending poles). 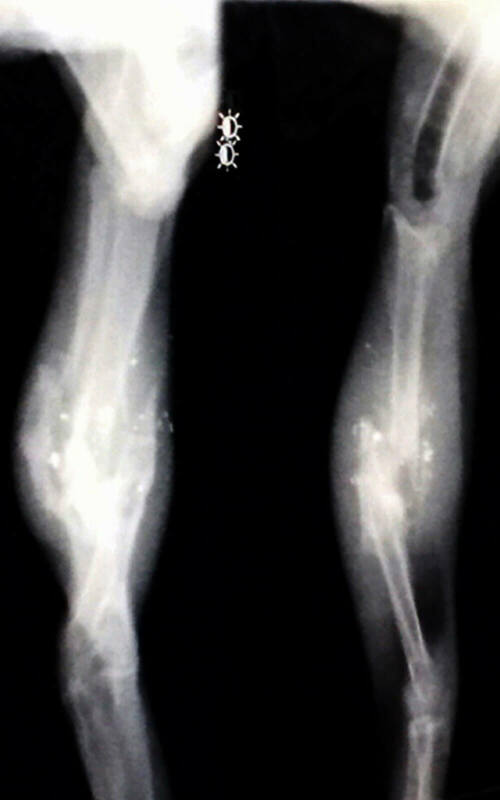 X-ray showing the compound fracture and lead fragments of a Crowned Eagle shot in Hillcrest. 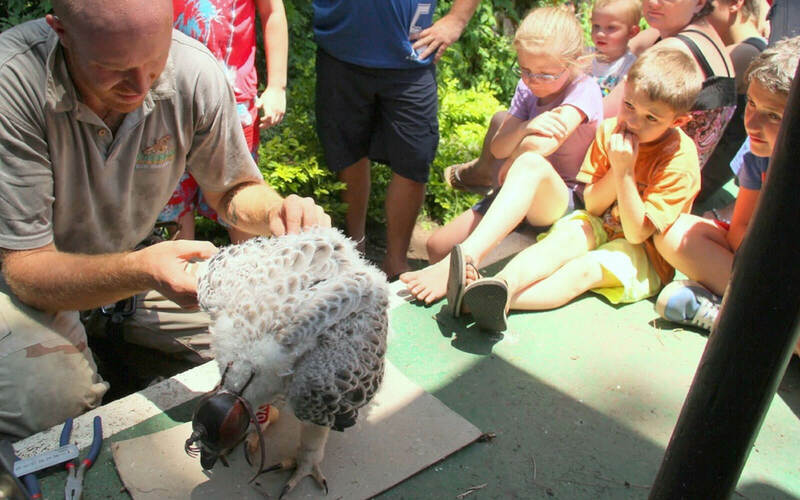 This eagle was treated for over a year at Raptor Rescue and released into the wild. The most recent electrocution of a eight month old eagle occurred at Renishaw, South Coast in April 2018. The wires of the transformer have subsequently been fitted with insulating rubber to prevent future electrocutions. Other causes of death and injury include poisoning, and collisions with fences, glass, and vehicles. In remote areas a non-lethal injury such as a broken bone often results in a drawn-out death from infection or starvation. And fortunately, in urban areas there is a higher chance that caring persons might find an injured animal and with best intentions, attempt to provide care and rehabilitation. Durban has several organisations dedicated to the care and release of injured wildlife. It is in the animal’s best interest that any person finding such an injured animal pass the responsibility onto experienced and qualified organisations (also, permits are required for such activities). The primary authority is Ezemvelo KZN Wildlife and any management actions regarding wildlife including Crowned Eagles must be addressed by a Wildlife Officer. Several NGO’s such as SPCA, FreeMe, and the Centre for Rehabilitation of Wildlife (CROW) handle the care of a great variety of wildlife in the region. Raptor Rescue specialises in the rehabilitation and release of birds of prey which require specialist care and housing (Ben Hoffman : 082 359 0900 : rescue@africanraptor.co.za). These NGO’s operate on a shoestring budget usually by volunteers, donations, and sponsorship. Having answered a few questions about the distribution and diet of resident Crowned Eagles our efforts have shifted to bigger more ambitious questions. So far the injuries and deaths recorded indicate the types of hazards that befall Crowned Eagles, but the extent to which this affect the health of the population remains uncertain. Studies on other urban raptors show that sometime although they seem to be thriving, the population is only maintained by drawing in individuals from the surrounding wilderness. In this case an urban area can act as a sink for the region. Is the high productivity of urban Crowned Eagles keeping ahead of the mortality of immature eagles? This kind of study requires a lot of data from many individuals who can be uniquely identified. Unlike leopards, cheetah, and zebra, the colour patterns of a Crowned Eagle does not serve as a unique identifier. In many bird studies leg rings are used to identify individuals, and we have been attaching such rings to nestling Crowned Eagles since 2012. Care is taken to correctly age the chick, as it grows the bones develop much faster than the flight feathers. This means at 70-80 days of age the leg bones are already 90% adult size, long before the chick can become physically and mentally prepared for its first flight at 105-120 days old. So in this narrow time window we climb to the nest without risking the chick jumping to escape. The chick is then brought to the ground safely so many hands can work on attaching the ID rings and quickly taking samples and measurements. The chick is returned to the nest within 1-2 hours. 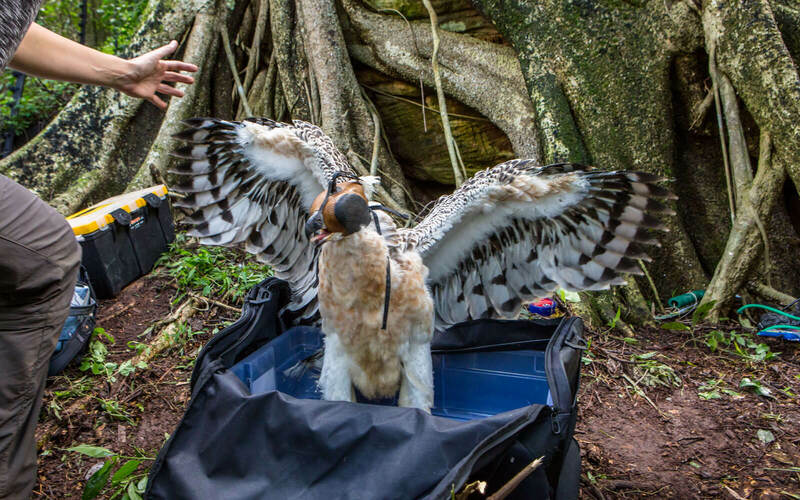 The Crowned Eagle chick has been brought to the ground in a new transport bag (donated by Kloof Conservancy in 2017). Children and adults in the Hatton Estate neighbourhood mesmerised by their up close and personal experience with their eagle chick. One of the most memorable ringing attempts of the entire project was in Krantzkloof Nature Reserve. On the 27 December 2017, accompanied by Paolo Candotti, reserve ranger Theo Harry, Bruce Crouch and our assistants, we met at 5am for a five-hour epic to one of the remote corners of this beautiful reserve. Hiking down to the Molweni river and halfway up the other side of the gorge, carrying packs of ropes and eagle ringing equipment, we reached the nest tree mid-morning. Access to the nest was 20 meters up a mature Natal Forest Mahogany. We attached the ID ring “green V8” to the nestling on the forest floor, among giant boulders and cycads. This was the 100th chick ringed for our project! Taking 4 -5 years to mature, it is only now that the first chicks of 2012 and 2013 are reaching breeding age. As more eagles mature, many questions regarding the duration of pair bonds, and nest site fidelity can be answered by following ID ringed individuals. In 2017, for the first time, we observed two tagged females at potential nest sites. In Queensburgh “red S6” even managed to hatch her chick. Unfortunately, perhaps due to her inexperience, she was unable to nurture the chick through its most vulnerable first week and she failed in her breeding attempt. Our ringing project depends entirely on the involvement of citizen scientists. 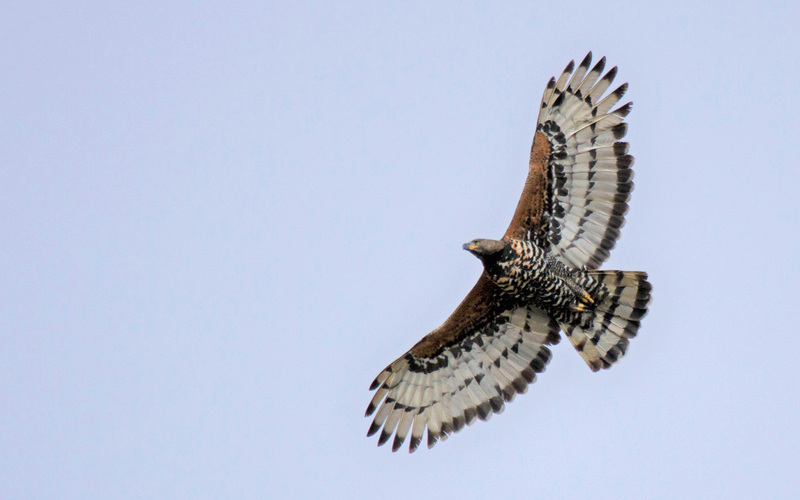 If you see a Crowned Eagle, first… enjoy the sighting! Then pay special attention to its legs, can you see a colour ring? Where possible please try and identify the ring number and report to shane.mcpherson@gmail.com, or http://safring.adu.org.za/numbered_ring.php. Although it may not be visible, these rings have good contrast in photos so no matter how grainy the photo please send them to us, along with the date-time and GPS or address of the sighting! We are very grateful to the many local organisations who have supported the Crowned Eagle Research with donations and a flood of sightings and support. Please visit our page at facebook.com/CrownedEagleResearch or our Twitter handle @urbanraptors. Shane McPherson is a postdoctoral researcher at the University of KwaZulu-Natal. His research interests include birds of prey and their interactions with natural and human factors. Shane has been researching the urban Crowned Eagles in KwaZulu-Natal since 2012, gaining a PhD in the process. 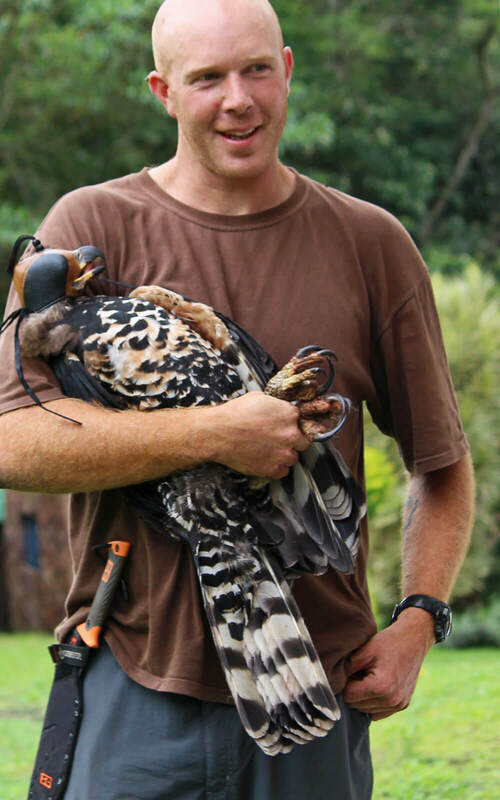 He is a New Zealand citizen and has worked in many countries on the conservation of birds of prey and other wildlife.